Yet, I have only just realised that I can make the upload system better for both QIP and myself. In the past I have named the upload documents according to their content. 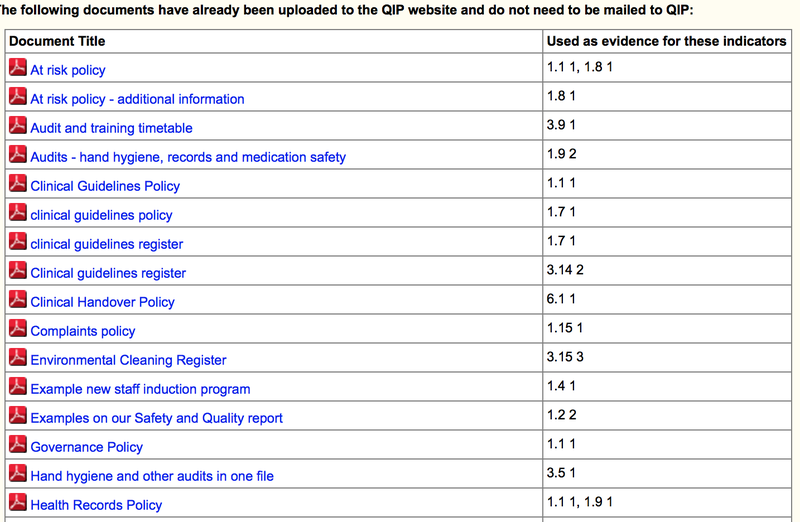 This results in a messy document list on QIP because QIP sorts the uploaded documents alphabetical. Try naming the document by the action number e.g. the Governance policy becomes ‘1.1.1 Governance Policy’. Then you have a document list in QIP that can be checked against the ADA document evidence list (available as a handy cheat sheet on the ADA website). This also will help QIP as they do a check to see all your documents are present. Remember that 1.7.1 needs to be listed as 1.07.1 or the sequence wont be correct when you come to 1.15.1 ! !